Looking for a new Windows PC for school and want to take advantage of Microsoft’s buy a Windows PC and get a free Xbox 360 back to school deal? Then we recommend you hurry as the deal ends this Saturday, September 3rd. For those who’ve never heard of this deal, it basically works like this. If you’re a student and you buy a new Windows PC at $699 or more Microsoft will throw in a free 4 GB Xbox 360 to go with it. The deal is open to both high school and college students and all you have to do to get it is show your Student ID if your buying in a store or a enter your .edu email address if you’re buying online at sites like the Microsoft Store, Dell.com or HP.com (this is the email address your college gives you once you enroll). If you’re a high school student and don’t have that .edu email address, try chatting with an online sales rep or calling the company’s sales line (their phone numbers are usually listed at the top of their sites). And remember, the deal also isn’t necessarily done by all stores (Staples and Best Buy, for example, don’t offer it), so you’re probably better off buying online or calling your preferred store before you go to make sure you get the deal. So yeah, if you want that new PC and free Xbox you better hurry before the deal ends. Waiting for AT&T to release their 4G, glasses-free 3D beast also known as the LG Thrill 4G? Well, your wait is finally almost over. Beginning this Sunday, September 4th, the Thrill 4G can be yours for a solid $100 with a new 2 year contract and data plan. For those who don’t know, the Thrill 4G is one of AT&T most powerful 4G Android phones to date, with some pretty powerful specs like a dual-core 1 GHZ processor (so everything you do on it from 3D gaming to basic texting is fast and smooth), dual 5 megapixel back cameras with a second front camera for video chat (so you can not only watch 3D but shoot 3D videos too), Android 2.2 (though hopefully it will soon be upgraded to the latest Android 2.3 Gingerbread. AT&T and LG also have given the Thrill 4G special 3D apps like a 3D version of YouTube and the LG 3D Space app store so you can make full use of that 3D screen), support for AT&T’s 4G HSPA+ network, and of course that amazing 4.3 inch qHD glasses-free 3D screen (and since it’s a qHD screen everything from those 3D videos and games to your texts and Facebook will look great). We were pretty impressed when we saw the Thrill 4G, and at just $100 it looks to be a solid deal for AT&T users looking for a powerful phone for back to school but don’t want to pay over $100 (and some places like Target are even offering it for just $80 on contract). You can see more of the Thrill 4G at AT&T’s preview page here. Things just keep getting better for Sprint users. If you’re on Sprint and waiting for the iPhone, your wait looks to finally be almost over. According to the Wall Street Journal (one of the most respected news outlets in the country and a place with a pretty good track record when it comes to Apple rumors), Apple will finally bring the iPhone to the Sprint network in the middle of October of this year. Yes, the iPhone looks to be finally coming to Sprint and it looks to be here soon. Now if you ask us, we do believe this Wall Street Journal article and we do think the iPhone will finally be coming to Sprint this year. We thought this a few months ago and it just all makes sense. Think about it: Sprint runs the same 3G network as Verizon (both use a technology called CDMA which is used in the Verizon iPhone 4), Apple needs to keep up with Android and Windows Phone (and there will be some awesome new Android and Windows Phone 7 phones coming out over the next couple of months to give the next iPhone a real run for your money), and we know Sprint and Apple have been testing an iPhone on Sprint’s network since at least this past June (and they probaly were testing even earlier than that). Putting the iPhone on Sprint now gives Apple the ability to stay ahead and kill a lot of Android and Windows Phone’s momentum while opening up the iPhone to Sprint’s 52 million users. I mean how many of you Sprint users will jump to the iPhone when its time for your next upgrade? And according to the latest rumors Sprint will not just be getting the iPhone 5 (or whatever the next iPhone is called) but also their version of the iPhone 4 too (this iPhone 4 will be cheaper than the iPhone 5 and may have some updates like a better antenna. This also makes a lot of sense and is like an updated version of what AT&T does right now with the iPhone 3GS and iPhone 4). We’ll of course keep you updated as we learn more, but Sprint users– you excited? 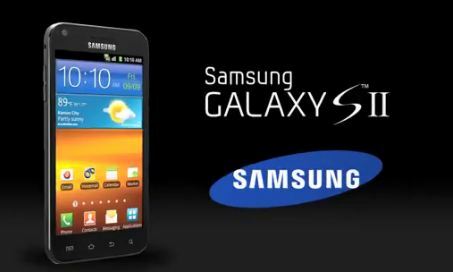 Samsung Begins The US Galaxy S II Teasing– Is This The Sprint Version? Well we now know for sure what Samsung will be announcing at their big New York event next week— the long-awaited US versions of their hit Android superphone, the Galaxy S II. Samsung has begun releasing some YouTube videos like the one above which, you guessed it, are all about how the US will finally soon be getting the Galaxy S II. Not much else about the Galaxy S II is mentioned in this teaser video, though we now know that we should expect the US versions to keep the Galaxy S II’s insanely thin design, front cameras and large, amazing screens. If you’re looking for a new Android phone for back-to-school those features alone should make you want to wait to learn more about this. Oh, and if you look closely at the Galaxy S II at the end of the video (or in the pic above) you’ll notice that it’s different from the European Galaxy S II Samsung otherwise is showing off in the teaser video. That Galaxy S II has a large button on the bottom below the screen while this Galaxy S II has no button and also lists Kanasas City in the weather widget. Now this is just a guess on our part but perhaps this is the Sprint version of the Galaxy S II (rumored to be called the Epic Touch 4G after Sprint’s first Galaxy S phone, the Epic 4G).This all fits in with the other rumors about Sprint’s Galaxy S II– including the rumored September 9th release date (which is also the date listed on the clock widget)– and Sprint is based right near Kansas City in Overland Park, Kansas. Check out the above video for yourself and let us know what you think. Samsung also said on their Twitter that they will be releasing new US Galaxy S II info everyday at 10 AM Eastern, so who knows what will be revealed next. And don’t forget to check back here next week for everything you need to know on everything Samsung announces. Looking for a new BlackBerry on Sprint but aren’t impressed with the new Bold 9930 or Torch 9850? Well, then you may want to check out this brand new Curve. This new Curve 9350 brings a lot of the updates of the new Bold and Torch lines but at a much better price: $79.99 with new 2 year contract and data plan. And if you’re a fan of the Curve line you’re really going to like what Sprint and BlackBerry have done here. This new Curve 9350 is without a question the best BlackBerry Curve yet with features like: an improved 2.44 inch touchscreen above that great BlackBerry keyboard (it’s a higher resolution screen which means that everything from BBM’s to Facebook to websites will look really nice on here. And like the Bold 9930 the screen is now multitouch so you can do things like pinch-to-zoom in the browser), 800 MHZ processor with 512 MB of RAM (so things here don’t just look good but are much faster too), 5 megapixel camera with HD video recording (like the other new BlackBerrys there is no front camera here), and the latest BlackBerry 7 OS. All in all, this looks to be a great upgrade to the Curve line and an excellent choice for Sprint users who want a good BlackBerry but don’t want to pay $200 for a Bold. The Curve 9350 will be available for Sprint users beginning September 9th. For more info on the new Curve, check out BlackBerry’s site here. 4.3 inch qHD screen— Like the Photon 4G, Sensation 4G and most other top of the line phones today. In short, this is a screen that will make everything you view on it look great. 1 GHZ dual core processor– So everything on the phone is as fast as that Verizon 4G LTE. 8 megapixel back camera with front camera for video chat— The back camera can also record videos in full 1080p HD. Now Motorola has confirmed that the Bionic will be coming in September, with the latest rumors saying it will launch September 8th for $299.99 with new 2 year contract and data plan (which makes sense to us given how all the other Verizon 4G LTE phones started out in that $300 price range when they launched). There are also rumors that the Bionic will get its own laptop dock like the AT&T Atrix, but no word on that from the Best Buy ad. Hopefully this all means that Verizon and Motorola will make this all official soon. Stay tuned. UPDATE: The Verizon Wireless homepage now has link to a sign up page for email updates on the Bionic. There’s still no confirmed price or release date but it looks like all that is just a matter of time now. 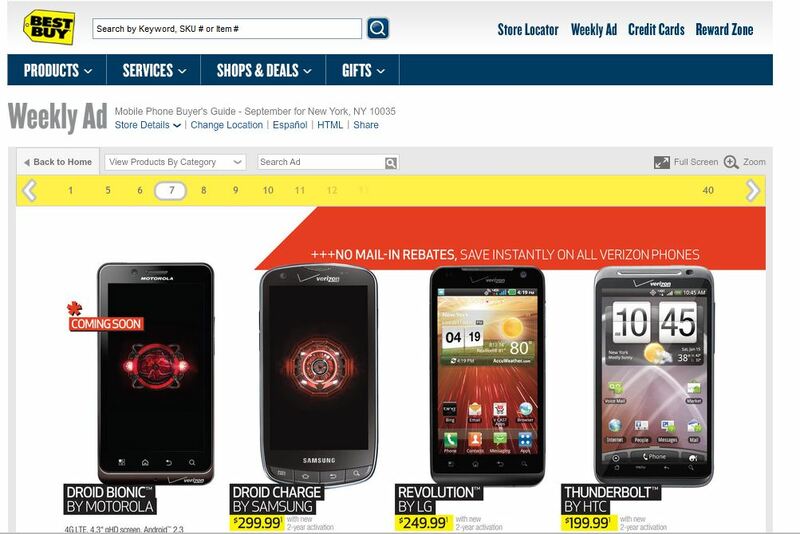 More pics of the Droid Bionic from Best Buy’s ad after the break. Well T-Mobile BlackBerry friends, it’s finally your turn. Verizon, Sprint and AT&T all announced when their new BlackBerry 7 phones will be launching and now T-Mobile has joined the fun. At the end of the month (aka August 31st) this new 4G Bold 9900 can be yours for the pretty expensive price of $299.99 with new 2 year contract and data plan. If you’re asking us we’d recommend waiting a few days or weeks for this to drop to a much more reasonable $200 on contract (and yes we wouldn’t be surprised to see someone like Best Buy, Walmart or Amazon do this so close after launch. It’s a great BlackBerry but not one worth $300), but if you need a new T-Mobile BlackBerry before school starts this still looks to be by far the best T-Mobile has ever offered. Just a recap of the T-Mobile Bold’s features, for those who don’t know it’s pretty much the greatest BlackBerry released yet. Features on the new Bold include a much faster 1.2 GHZ processor with 768 MB of RAM (so everything from BBMing to browsing the web is much faster), 5 megapixel back camera with the ability to take 720p HD video (there is no front camera for video chat), the latest and greatest BlackBerry 7 OS, support for T-Mobile’s 4G network, and that awesome BlackBerry keyboard underneath that 2.8 inch multi-touch screen. Full info on the Bold 9900 can be found here.